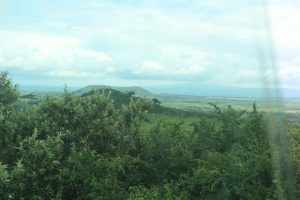 Our safari (Swahili for trip) to the city of Kisumu has brought with it many new adventures as the Kenya that had we had started to feel comfortable with in Kijabe seems to have changed into an entirely different world. Today especially was a struggle at times as we tried to process all of the changes as we went about our day. 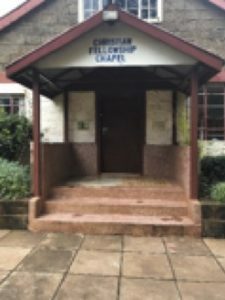 The day began with a trip to Kaimosi with our tour guide and contact here, John Muhanji, Director of African Ministries for the Friends (Quakers) in Kenya. The car ride included crossing from the Southern Hemisphere into the Northern Hemisphere. We all took gleeful photographs as we stood with one foot in each hemisphere! 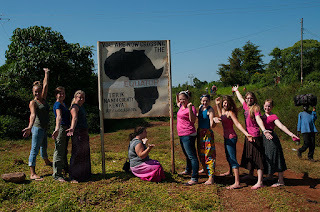 In Kaimosi we visited the missionary complex from which the entire history of the Friends church in Africa stems. In 1902, three graduates from the Cleveland Bible Institute (which later became Malone University) came to Africa, went as far inland as the currently constructed train would take them, and began their mission in Kaimosi. They began generating income for their mission by building a sawmill. Once they had sufficient funds, they looked for needs. Slowly they built a complex of several institutions including a hospital, teacher’s college, and college of theology. Today we started by touring the Friends Theology College and then continued to walk down “Mission Road” to see everything else these great men of vision began. We even saw the dam that they built. Our tour of FTC, a school of 45 students, was given individually by current students there, so we all had differing experiences depending on the personality of the FTC student who gave the tour. One experience involved a male student blatantly expressing interest in marrying one of the girls from our team. My experience, however, was much more pleasant as two overjoyed older female students showed me around. 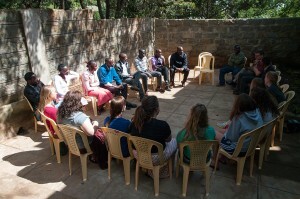 Our debriefing mostly included discussion on how our experience here in the western province of Kenya has differed from our experience in Kijabe. Differences stem from several dynamics including tribal affiliations and location. Tribally, we have left Kikuyu country and come to the home of the Luo and the Luhya people. So far we have noticed differences in the housing and mannerisms of the people (such as woman and children balancing large bags on top of their heads). The people here are also less prone to making specific plans (especially our tour guide), so we rarely know what we will be doing in the next few hours. For example, we were told around 7 pm tonight that we will be leading a few songs at church tomorrow . . . We are all learning the real meaning of the phrase “go with the flow” and laugh a bit more as our adventure continues.